I’m that annoying girl that likes to take pictures. I’m the one that frequently asks waiters, sightseers and strangers to be a photographer. I don’t just like to document the big occasions in life such a birthday, holiday or vacation. I like to take pictures any time I’m with someone other than myself. I suppose that’s the reason I have boxes full of photographs of my family, friends, old houses and pets. Since I fit into the percentile that would run back into a burning house to grab all of my old pictures, I have strategically placed all of the photo boxes together for easy retrieval. I don’t discriminate when it comes to taking pictures. Whether the moment is sweet, funny or odd, I’ll capture it. There is one particular childhood picture that further demonstrates this philosophy. At the age of 10, I had just given birth. My 6-year old brother was the delivery doctor. If you have a hard time believing that this actually happened, I have the picture to prove it. There I am, lying in the bed, dressed in a hospital gown, smiling from ear to ear as I cradle my brand new cabbage patch baby. My brother, decked out in a doctor’s coat with a stethoscope, proudly stands next to the digital clock on the nightstand, verifing the time of birth. It’s strange, I know. But even as a child, I enjoyed taking random pictures. Even stranger is the fact that a picture of me from 16 years ago will probably be the only picture that ever exists of me in a hospital gown holding a baby. The truth is I cherish pictures. I’m a nostaglic person. I like to be reminded of places and people and periods of time that can never be re-visited. Perhaps this is why I stalk strangers on Facebook by browsing through their photos. I mainly cherish the last picture. We’ve all been there. Staring blankly at a picture of you and a past boyfriend or girlfriend wondering what you would have done differently in that moment if you would have known it would be the last picture ever taken together. Smile bigger? Hold on tighter? Kiss longer? Often times that particular last picture gets ripped into shreds or thrown into a bon fire as friends bare witness and cheer us on. But I’m not necessarily referring to just romantic relationships when thinking back on last pictures. It carries over into every facet of life. For instance, I cherish the last picture ever taken of my family of four. We had no idea that when my family traveled to hear Carrie and me sing at a smokey bar called Puckets, we would never again take a picture together. Not even getting married could warrant having a picture taken with all four members in the frame. The Puckets picture is the last picture that was and will ever be taken of the Short family because the Short family has dissolved and evolved. However, one last picture stands high above all the others in my collection. It was a random week night in college and AJ had decided to make a trip to Charlotte to come visit Carrie and me. The three amigos had finally been reunited. Although we had changed a lot in college from the people we were in high school, the fact remained we were still the best of friends and whenever together, laughter would be involved. We spent the entire evening reminiscing, laughing hysterically and, of course, taking pictures. I had no idea that a year later, AJ would be taken from us and that I would never again be able to hear his hearty chuckle or feel his generous hug. The month of June always makes me think of AJ and thinking of AJ always reminds me of that last picture of us together. It now sits in a frame on my desk as a daily reminder of how our final time spent with one another, doing absolutely nothing in the middle of a Buffalo Wild Wings, will be forever remembered because a camera captured it. And for that, I am proud to be the annoying girl that likes to take pictures. Sometimes a picture is worth a 1,000 words but sometimes there are no words to describe the last picture’s worth. 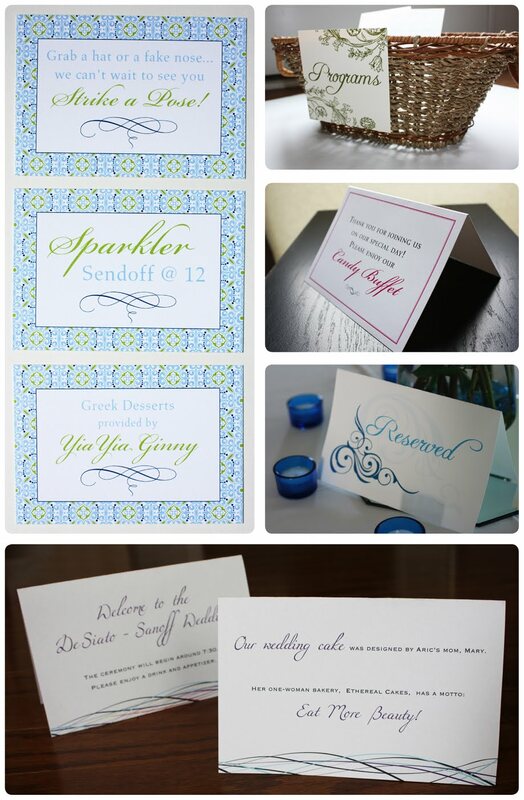 Orangerie Events and emDOTzee hosted a contest in the month of April to reward one of our Facebook friends with customized stationery. 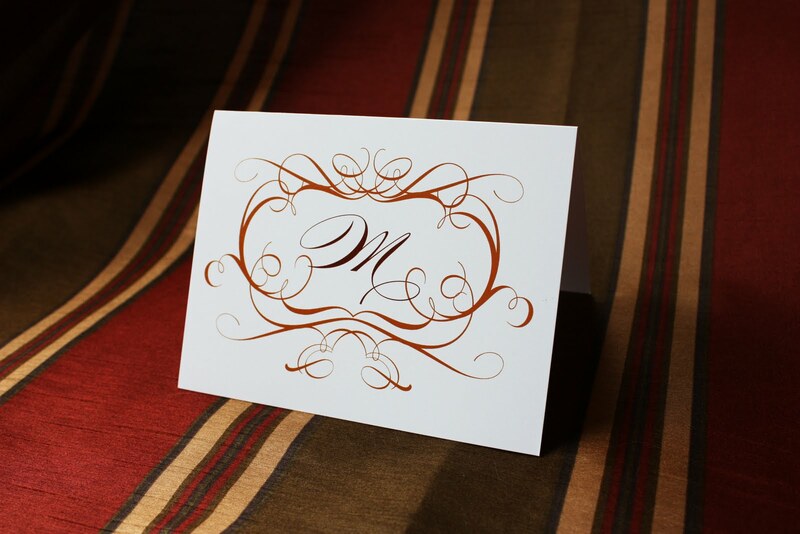 Meredith Barlowe was selected as the proud recipient of the note cards pictured below. We couldn’t have selected a more deserving winner. Take a moment to read a message from Meredith describing her feelings on winning personalized stationery from Orangerie Events and emDOTzee. I promise I remember how to type and how to post a blog entry. I took an unexpected hiatus from the blogosphere. I refuse to look at the date on my last entry because it will only deepen my disappointment in myself. I’m sure you’ve missed reading about my rants and raves and dysfunctional adventures, but rest assured, I’m back and I have a slew of stories aching to be told. 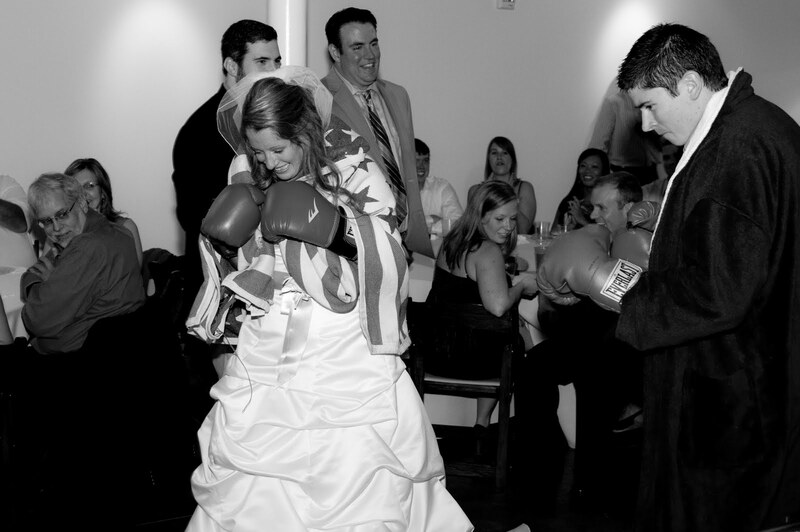 What better way to jump back into the swing of things than by featuring the first wedding of the 2010 season? I originally spoke to Sarah Joines about assisting with her wedding on December 14, 2008. 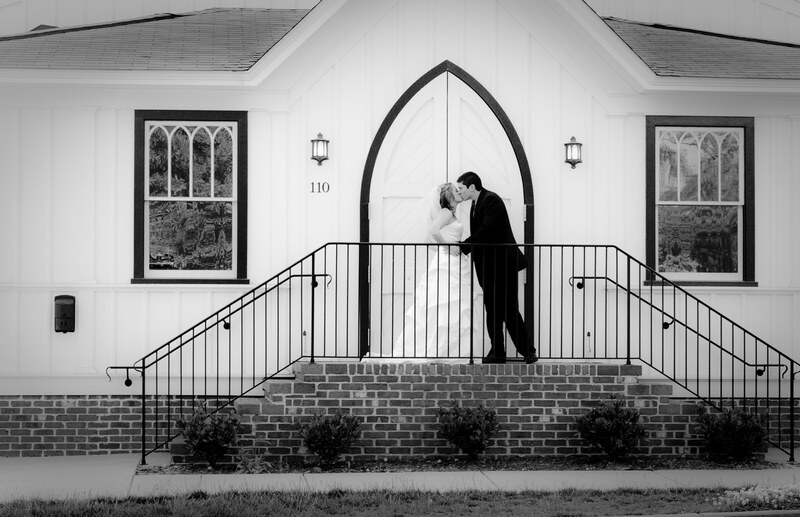 16 months later, Sarah Joines and Tim Hall’s wedding day finally arrived. (If you’re a sports fanatic, be sure to visit the link to Tim’s blog for 99.9 The Fan.) 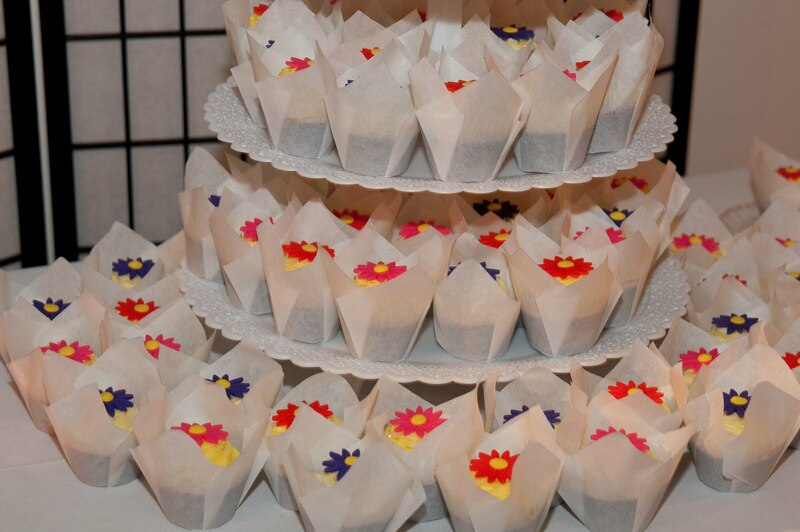 It just goes to show that you can never be too early in securing your vendors and especially your wedding planner. 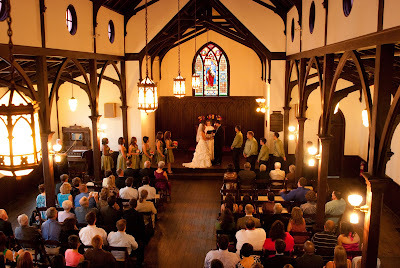 Sarah and Tim were married at the gorgeous All Saints Chapel in downtown Raleigh. 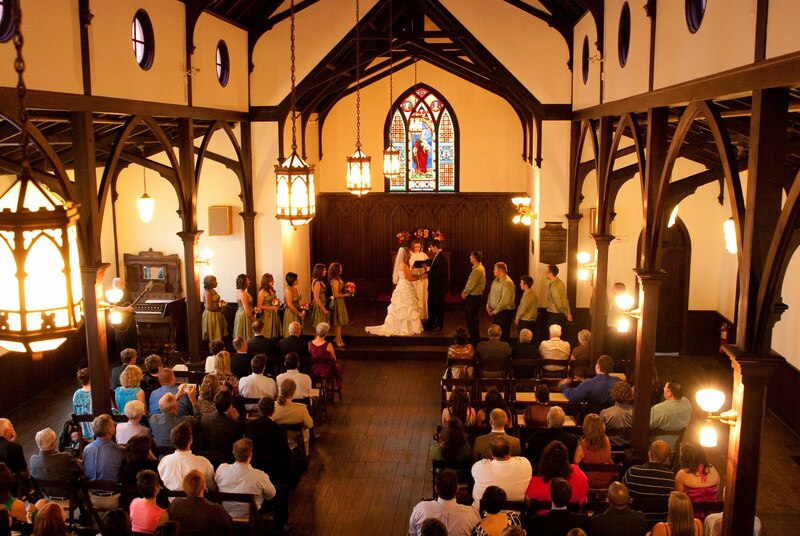 From the stained glass windows to the exposed wooden beams, the All Saints Chapel provided the perfect rustic backdrop for an intimate ceremony. 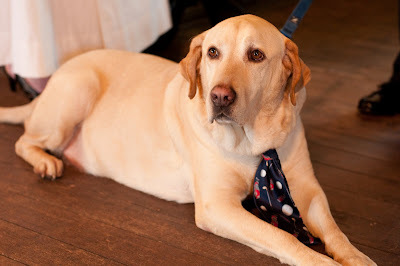 The couple’s beloved pet Angus even made a special appearance as part of the wedding party. (Although he successfully followed Sarah down the aisle during rehearsal, Angus got a case of cold paws on the big day.) The wedding was beautiful from start to finish and Orangerie Events thoroughly enjoyed assisting such a witty and kind-hearted couple. Wendy Lewis, owner of Wendy Lew Photography, served double duty as a bridesmaid and as the photographer. She succeeded beautifully at both jobs. Below are a few of my favorite pictures from the wedding, compliments of Wendy. 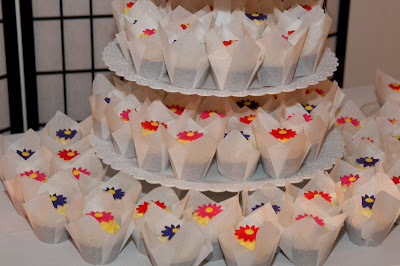 If you’d like to view more pictures from Sarah and Tim’s wedding, be sure to visit theOrangerie Events Facebook page. Until next time….and by next time, I mean in a couple of days and not in a month. 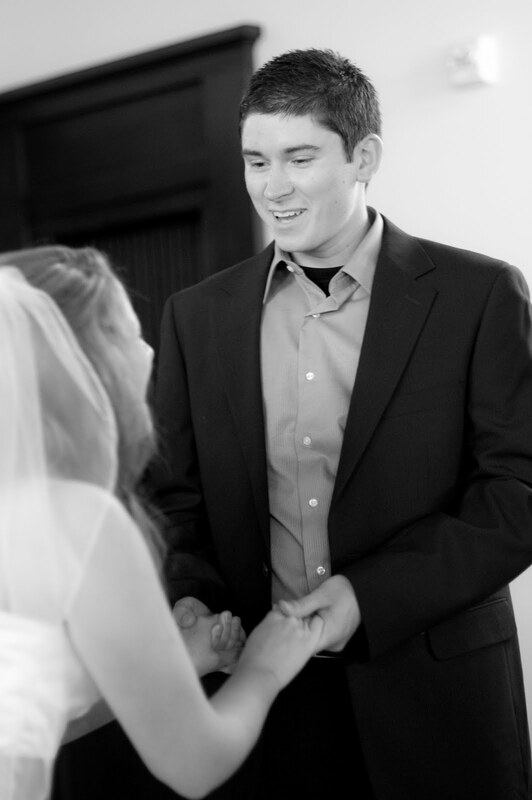 A true depiction of the couple – laughing. Angus even put on his best tie for the special occasion.